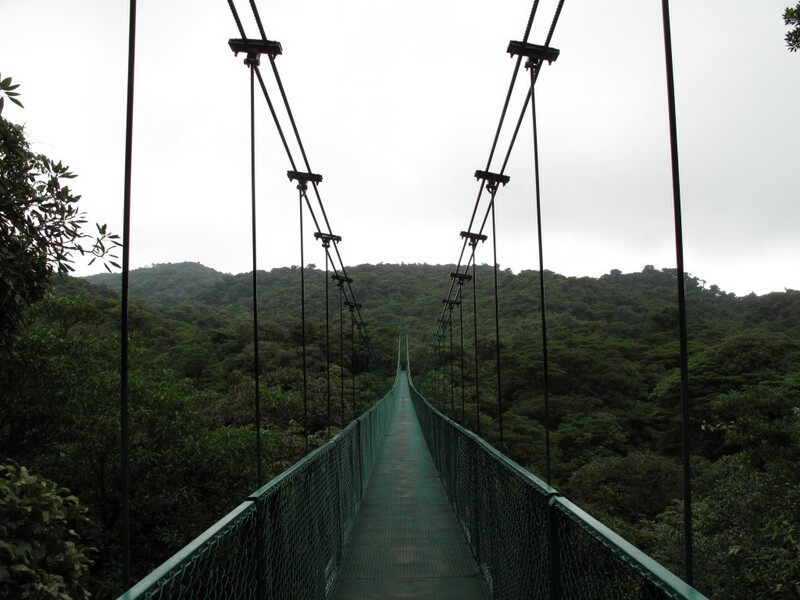 Set atop the spine of Costa Rica’s continental divide, Monteverde is a place of cloud forests, coffee plantations, monkeys, mist, and friendly locals, but it is a world above for one main reason – its zip-lines and suspension bridges are the longest, and most exciting, in the country. They are the ultimate bucket list experience in Costa Rica. The cables and platforms that are built into the cloud forest rather than above it, allowed us to feel truly immersed into the forested environment. Furthermore, the so-called “Tarzan Swing” at the end of the tour (a large, swing-like contraption that allows participants to swing out above the forest ) was an unexpected, but welcomed, surprise. 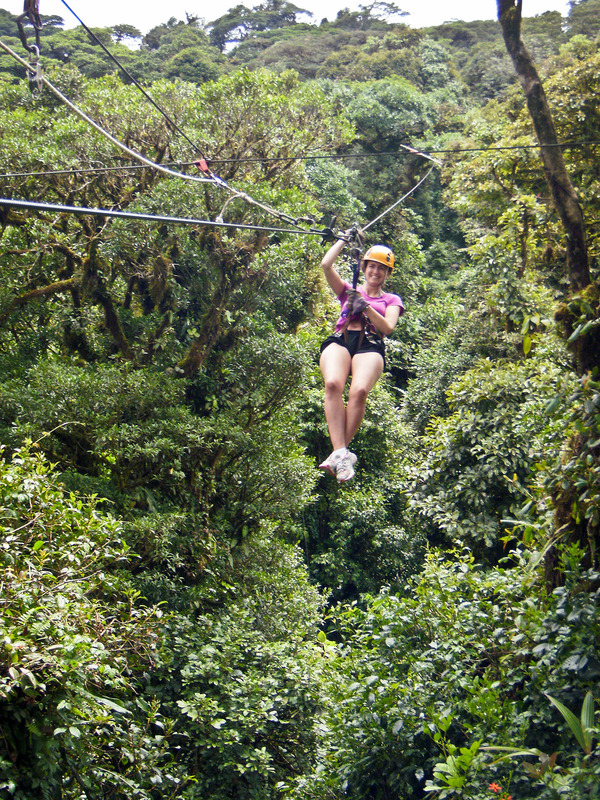 Once you do a canopy tour in Monteverde, all other “zip-lines” will feel like child’s play. The Monteverde Extremo Canopy Tour began with an introduction to the safety equipment by local, albeit YOUNG, well-trained guides. During this segment, we were fitted with harnesses and taught the proper technique for riding the cables. Soon after, the flight through the forest began. In total, there are 15 cables and 24 viewing platforms that stretch over 2 miles, which is the longest cable length of any canopy tour in Costa Rica. 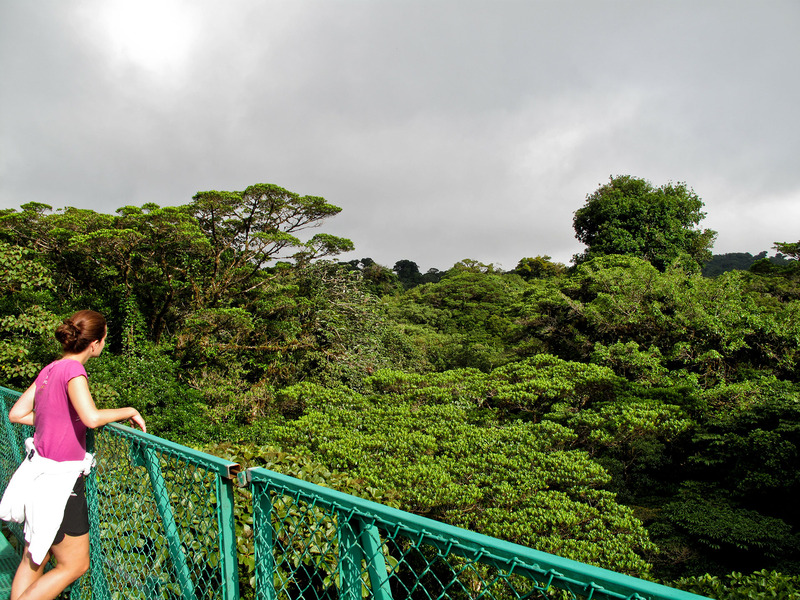 The treetop walkways through the cloud forest were an amazing ways to experience the beauty of this rare ecosystem. We didn’t need to worry about braking at the end of the the line. Our guides utilized a pulley system to slowly decrease our speed as we approached the next platform. Since our guides took care of starting and stopping us along each cable, we could relax and enjoy the ride. The tour didn’t require any kind of particular athletic ability. We had to sit down, remain calm, and focus on the zip line. The guides and gravity did the rest. Sometimes, the canopy tower where we waited for the next line was equally as nerve racking as the actual zip. One tower rests 72 feet tall in a group of trees. Changing lines while 72 feet in the air was one of the most worrisome parts of the day. The grand finale zip was a 1 kilometre long piece de resistance “Superman” zip-line that was over 456 feet high. Two people rode the line together because of the distance. Since I was there with my husband, we anxiously awaited this zip to have the greatest experience together. I felt like an eagle as we soared over the mountains and tree tops. It was a clear day and I had a stunning view of Volcan Arenal, the Pacific Ocean in the Nicoya Gulf and the Guanacaste area in the North of the country. It is a great juxtaposition to see the tress from below and then from this bird’s eye view above. The “Tarzan Swing” gave us the opportunity to free-fall a few metres before the harness safely lifted us into a relaxing swooping swing 50 metres high amongst the trees. Needless to say, it’s quite an adrenalin rush. Still, many people were content to simply watch us ride the “Tarzan Swing.” I didn’t mind the spectators; we asked them to take pictures and videos while we enjoyed the adventure. 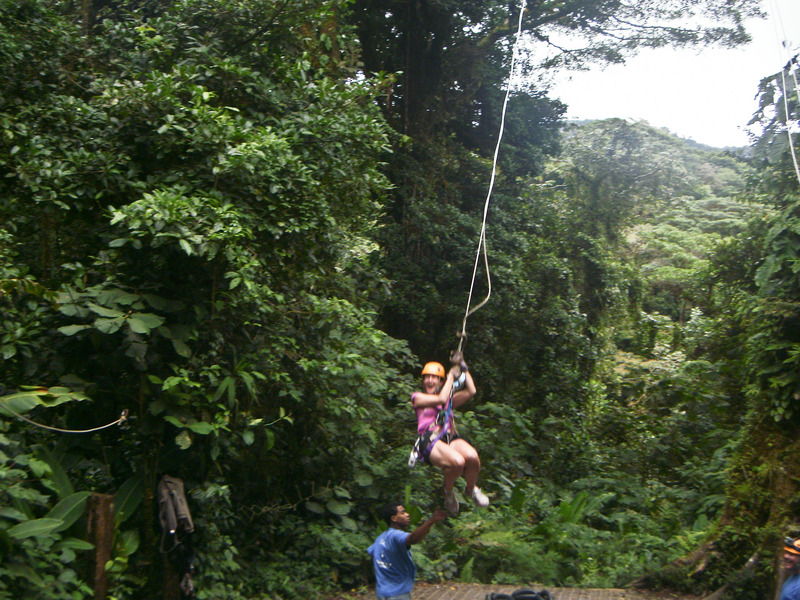 This was my first canopy tour and one of the greatest experiences during my vacation in Costa Rica. I don’t think you can go to Costa Rica and truly experience what it has to offer without participating in a canopy tour. If you have the change to try the “Tarzan Swing”, don’t pass it up. You’d paid good money for an adrenaline rush like that anywhere else, but here, it’s part of the tour. 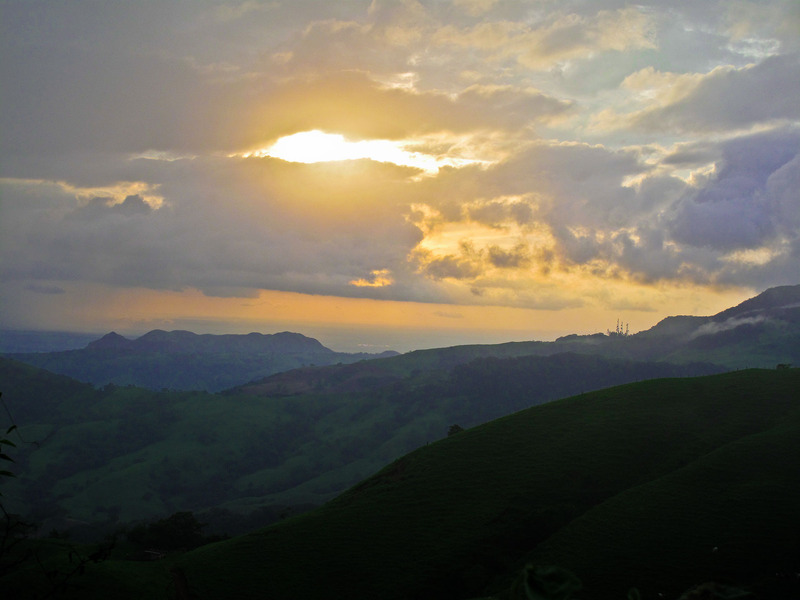 The drive itself to Monteverde is a worthwhile venture. The mountainous terrain, leading through villages with unique cultural heritage, is outlined by large, fluffy clouds and creates an amazing photo opportunity.